This page is where we’ll post info that may be useful for Block Captains. Any resident can join us in serving as a Block Captain or an assistant and backup Block Captain. By serving, you can contribute to your own safety while also helping your immediate neighbors and our whole community. Uploading documents such as locations and inventories of supplies, procedures, orientation materials, and anything else in document format. The advantages of placing those on the site include: availability to anyone the DPG designates at any time, elimination of copying hassle/expense, nearly eliminating the work required of a DPG member to store and distribute paper documents, and survivability of nearly any disaster since the site is maintained and backed up by WordPress at no cost. Aggregation and dissemination of information during disasters. As mentioned at the 4/15/2010 meeting, with minimal preparation it is possible to have web access during emergencies as some residents did for the entire duration of the Jesusita Fire including during power outages. This would be an excellent complement to the radios, since it’s available at any time without requiring anyone to monitor the radio or distribute info. DPG members and residents alike could get the latest information and requests for assistance whenever they have the time to check the site. For example, during the fire an SVMHP resident was able to give evacuees and concerned friends and relatives of residents in surrounding communities information about the fire and local conditions by posting updates on the Edhat online Local News section. Recruiting new members, organizing events, and making announcements to the DPG and/or residents. Highlighting less-known facts, like what the “OK” signs are for or what to do in emergencies. Publishing a periodical newsletter without the hassle/expense of printing & distribution. 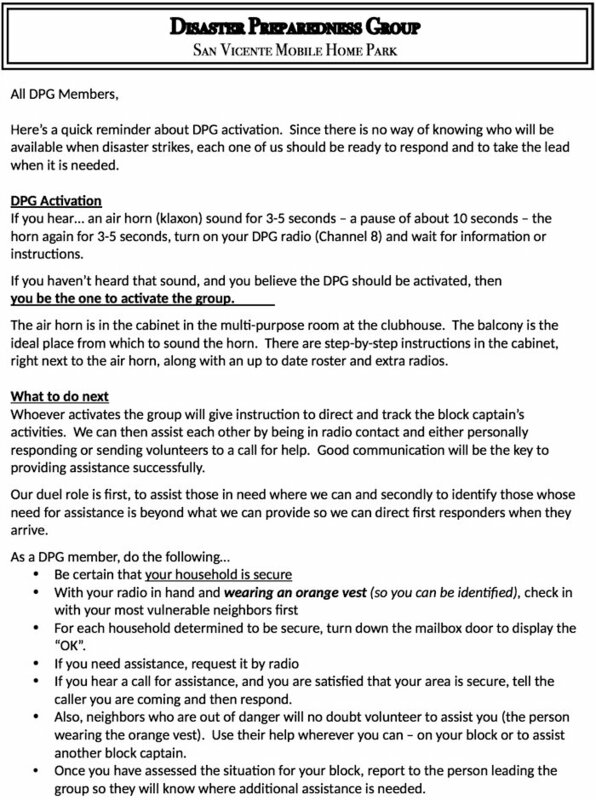 Publishing a list of needed items for donors who would like to support DPG without volunteering. Publishing minutes of meetings, radio check times or changes to those times. Creating and maintaining a list of people with special needs (with associated security and privacy measures).